Belém Tower is a fortified tower located in the Belém district of Lisbon, Portugal. It was built in the early 16th century in the Portuguese late Gothic style, the Manueline, to commemorate Vasco da Gama's expedition. This defensive, yet elegant construction has become one of the symbols of the city, a memorial to the Portuguese power during the Age of the Great Discoveries. In 1983 it was classified, together with the nearby Mosteiro dos Jerónimos, as a UNESCO World Heritage Site. The Belém Tower was built both as a ceremonial gateway to Lisbon and as part of a defense system of the entrance of the Tagus river and the Jerónimos Monastery, which was necessary to protect Lisbon. The system was initiated by King John II (1455-1495), who built the Fortress of Cascais and the Fortress of São Sebastião of Caparica. The banks of Belém were protected by a ship, the Grande Nau, replaced by the Tower of Belém during the last five years of the reign of King Manuel I. The Tower was constructed between 1515 and 1521 by military architect Francisco de Arruda, who had already built several fortresses in Portuguese possessions in Morocco. The influence of the Moorish decorative art is manifest in delicate decorations of the arched windows and balconies and in the ribbed cupolas of the watch towers. Diogo de Boitaca, first architect of the nearby Monastery of the Jerónimos, probably also participated in decorating the building. The machicolation and the battlements are decorated with the rich sculptural ornamentations of the Manueline style. 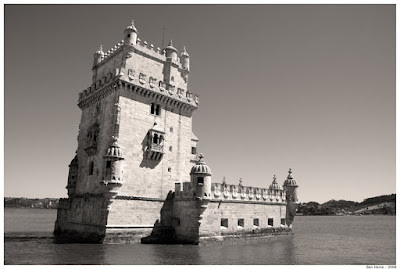 Originally, the Tower stood on a little island on the right side of the Tagus, surrounded by water. Opposite the beach at Restelo, with the progressive southward creeping of the shore over the years, it is now practically moored to the bank itself. It was dedicated to the patron saint of Lisbon, St Vincent. In 1580, when Lisbon was invaded by Spanish troops in the course of a struggle for the Portuguese throne, the Tower fought and surrendered to the Duke of Alba. In the following centuries the Tower was mainly used as a prison (with the underground cellars regularly flooding) and as a custom house. Indeed, given its height and lack of dissimulation in the landscape, some historians believe the Tower was mostly intended to serve as a customs outpost.